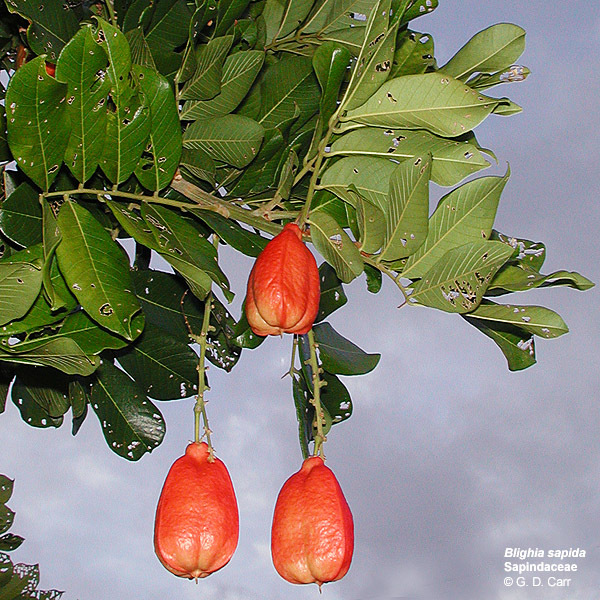 The Sapindaceae are mostly trees and shrubs, and tendril-bearing vines comprising about 140 genera and 1,500 species. 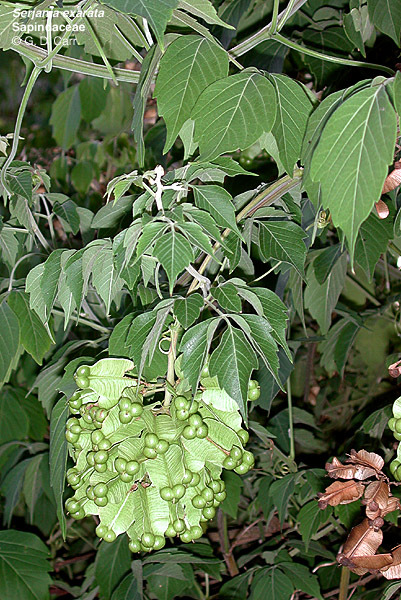 The leaves are alternate, simple, or more commonly pinnately compound; stipules are absent except in the climbing forms. The flowers are small, actinomorphic or zygomorphic, and commonly functionally unisexual, although a given individual may bear seemingly bisexual flowers together with either male or female flowers. The perianth typically is biseriate, consisting of calyx and corolla. 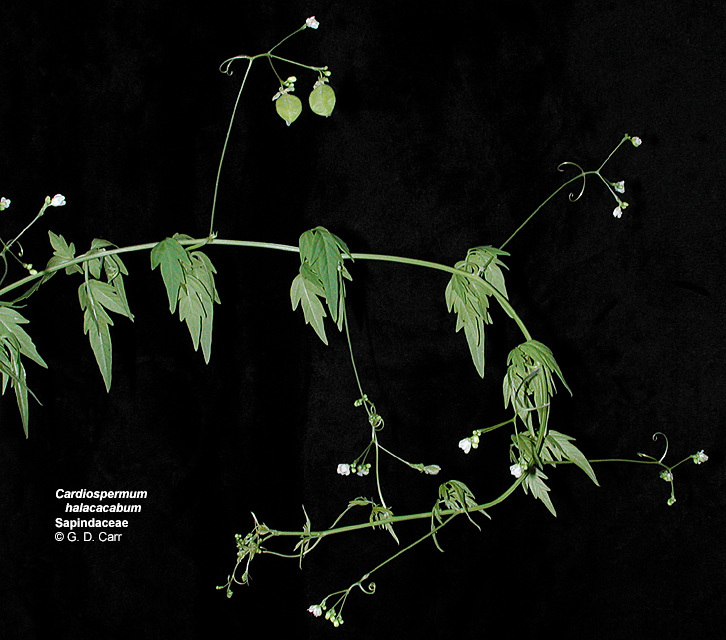 The calyx comprises 4 or 5 distinct or sometimes basally connate sepals. 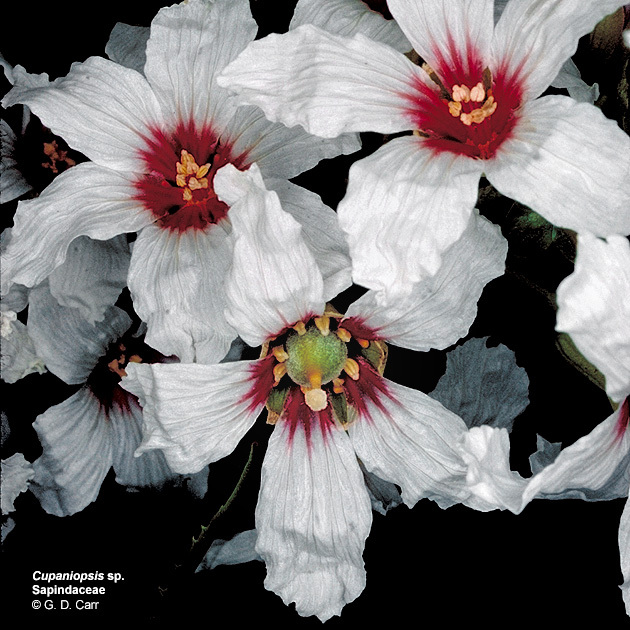 The corolla consists of 4 or 5 distinct petals or sometimes is absent. 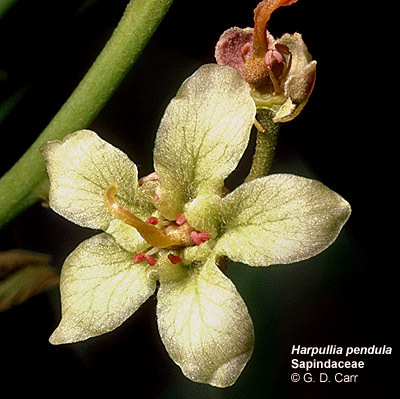 The petals commonly have basal appendages on the inner side. 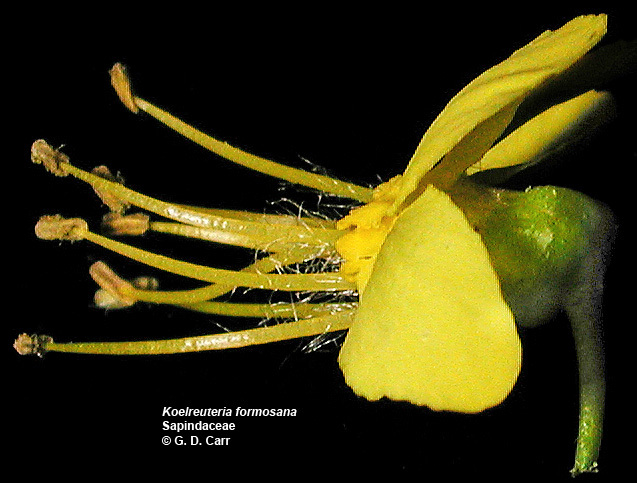 The stamens are distinct, often have hairy filaments, and in quantity usually are equal to or twice the number of calyx lobes. The gynoecium consists of a single compound pistil of usually 3 carpels, commonly an equal number of styles or style lobes, and a superior ovary usually with 3 locules, each containing 1 or 2 axile or axile-apical ovules. 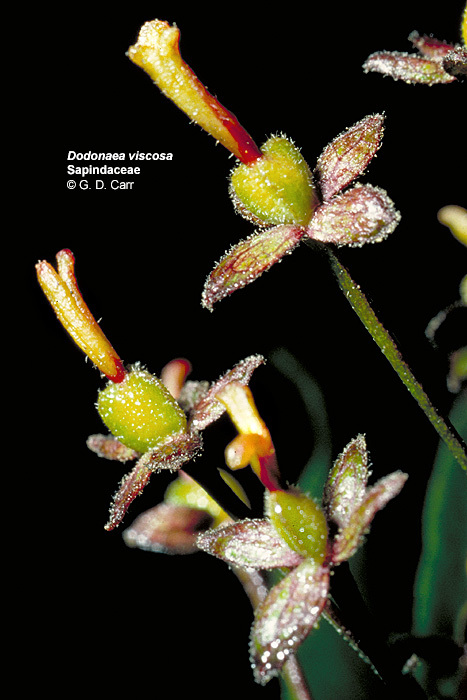 Most species have an extrastaminal, often asymmetrical nectary disk situated between the stamens and corolla. The fruit is variable. Allophylus sp. 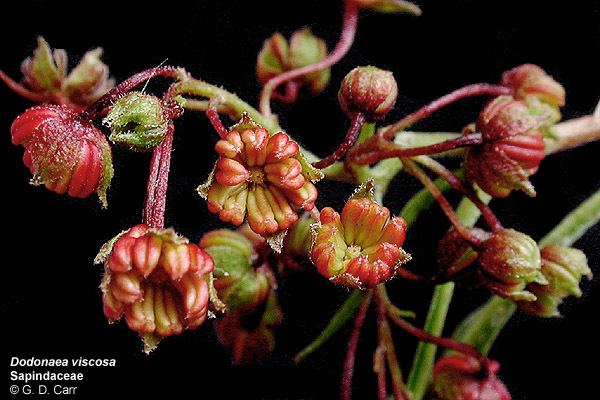 Note male and female flowers mixed within inflorescence. 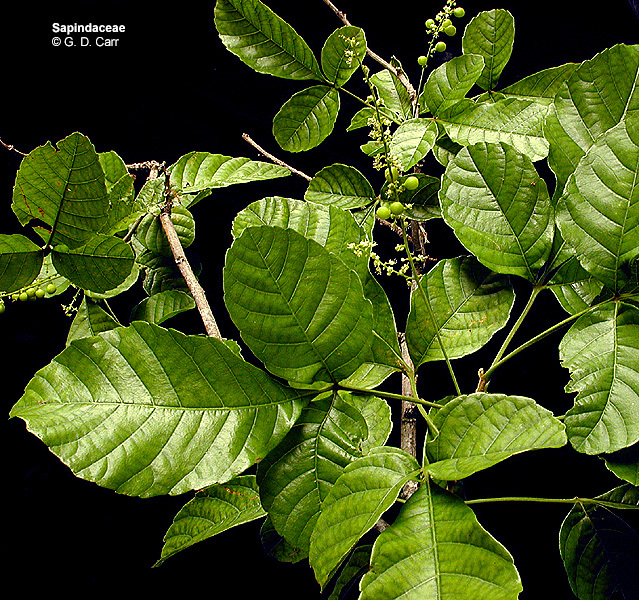 Blighia sapida, Sapindaceae, akee. 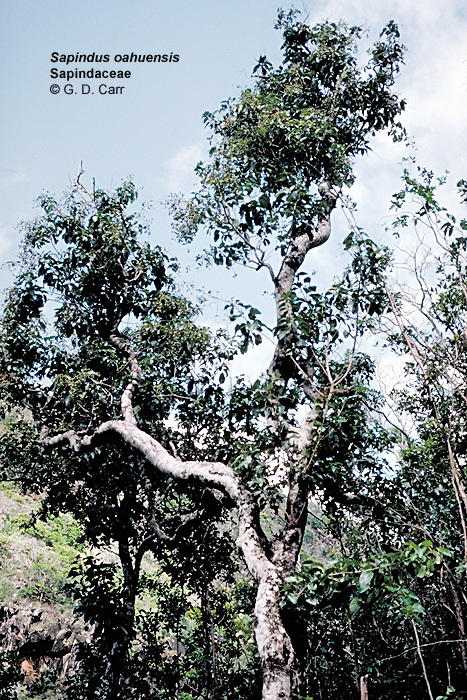 Tree from Guinea, named for Bounty captain, William Bligh. 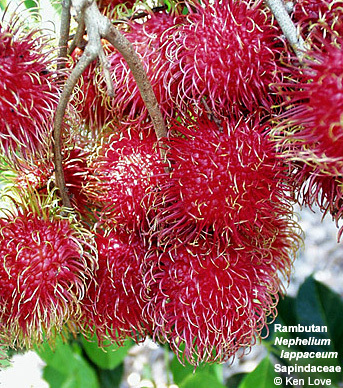 Reportedly, when the fruit is ripe (just after opening) the fleshy aril at the base of the seed is wholesome food when eaten raw, fried, or boiled. 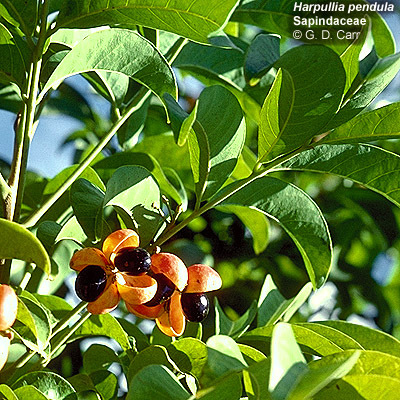 However, when green or overripe, the aril is said to be poisonous. According to Neal, the seed coat is poisonous. 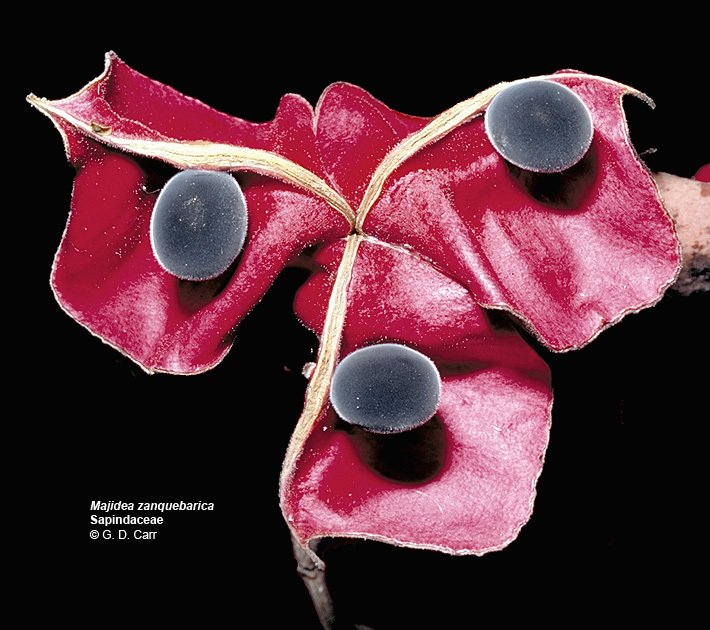 Cupaniopsis sp. 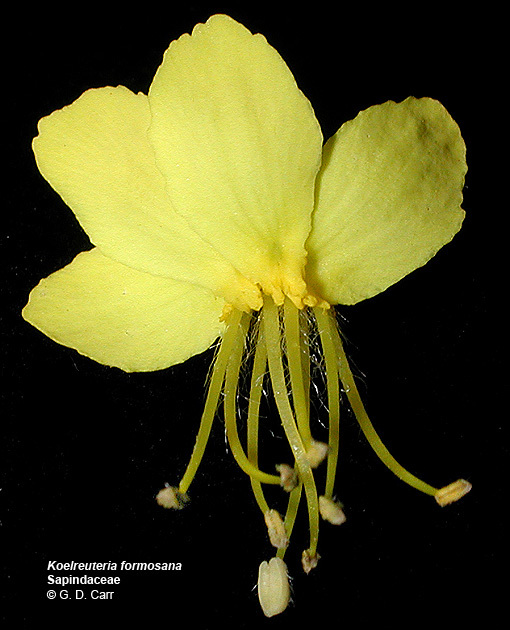 The lower flower is functionally female, although the flower looks bisexual. 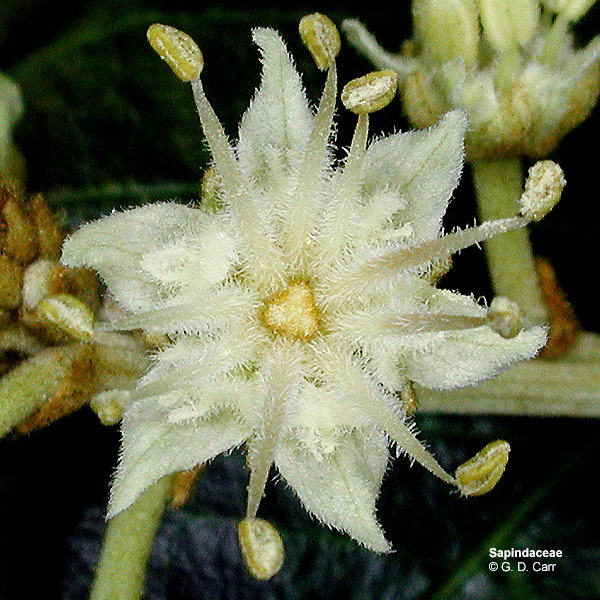 Though not obvious here, the 5-carpellate gynoecium in this species is exceptional in the family. 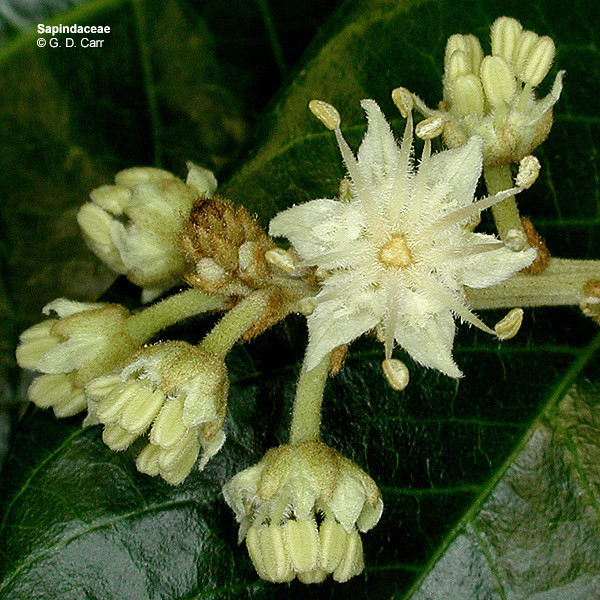 The two upper flowers are functionally male and show no evidence of a pistil. 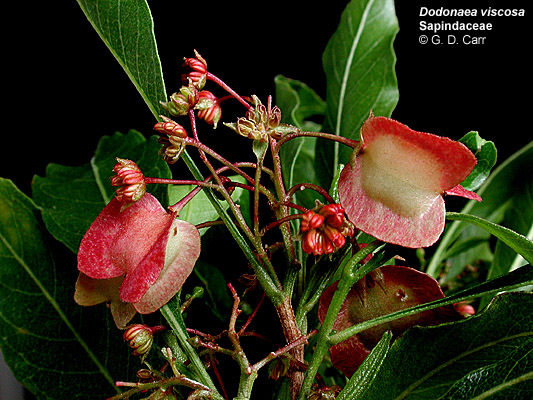 Dodonaea viscosa, 'a'ali'i. 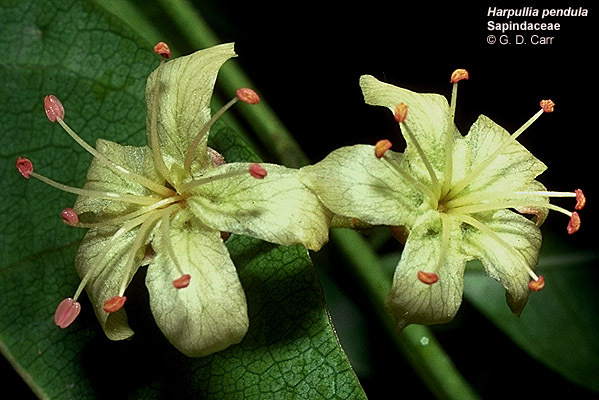 The female flowers of this native Hawaiian species lack a corolla. Note the 2- or 3-lobed ovary and style. The number of carpels varies from 2 to 4 in this species. 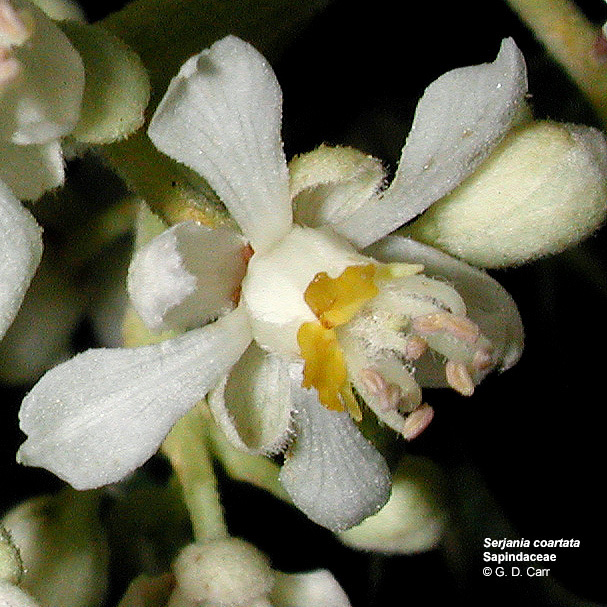 The male flowers (visible in the middle image) have about 8 stamens. 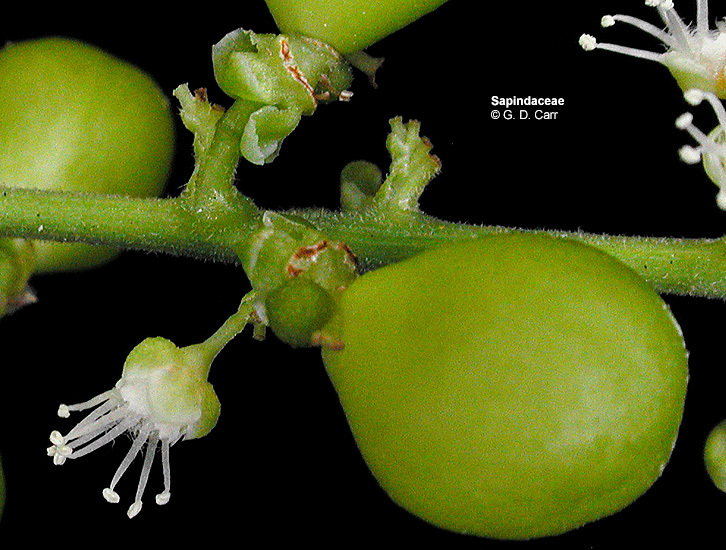 Though usually dioecious, this species may exhibit monoecy (right photo). 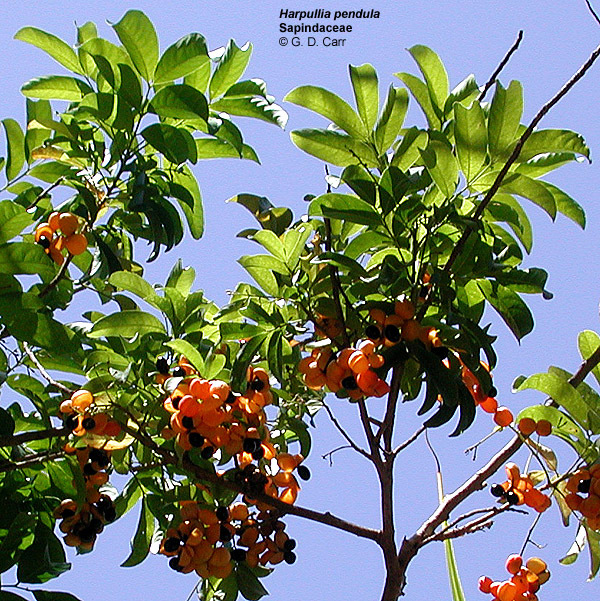 Harpullia pendula, tulipwood tree. 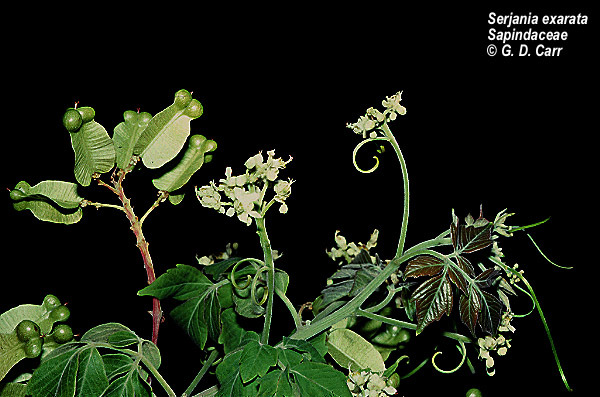 Note the pinnately compound leaves. 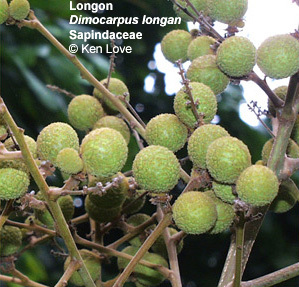 This species has 2-lobed fruits. 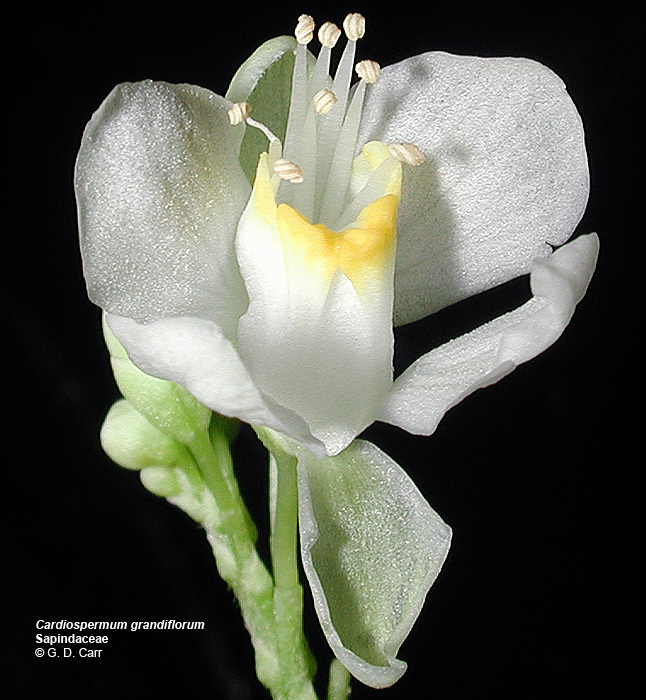 A functionally female flower is pictured at the lower left. Note the poorly developed stamens and the conspicuous pistil. 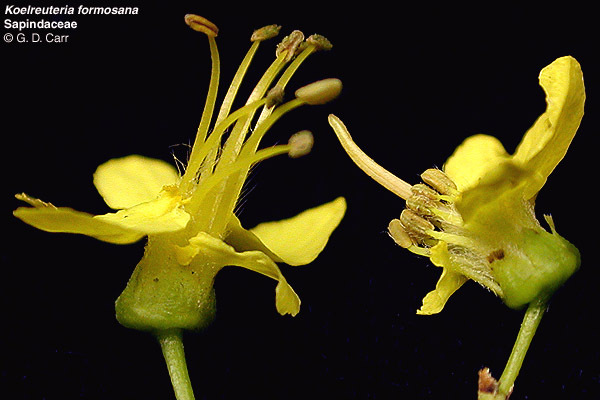 In the lower right photo are functionally male flowers with well developed stamens and no apparent pistil. 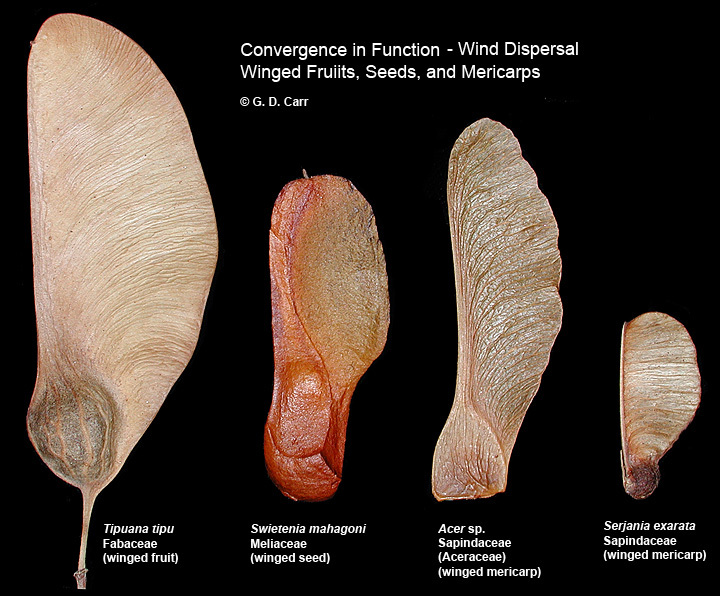 Koelreuteria formosana, golden-rain tree. 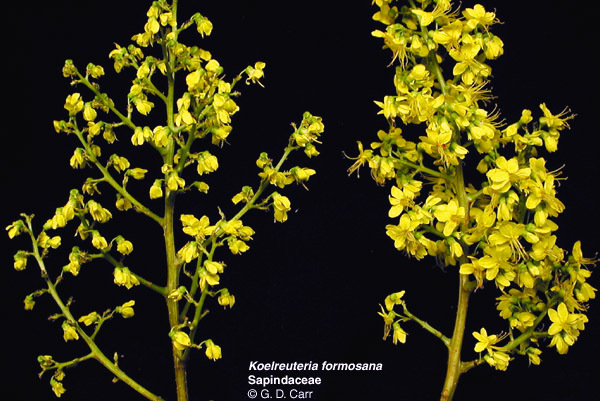 The first photo shows a portion of a female inflorescence on the left and male on the right. 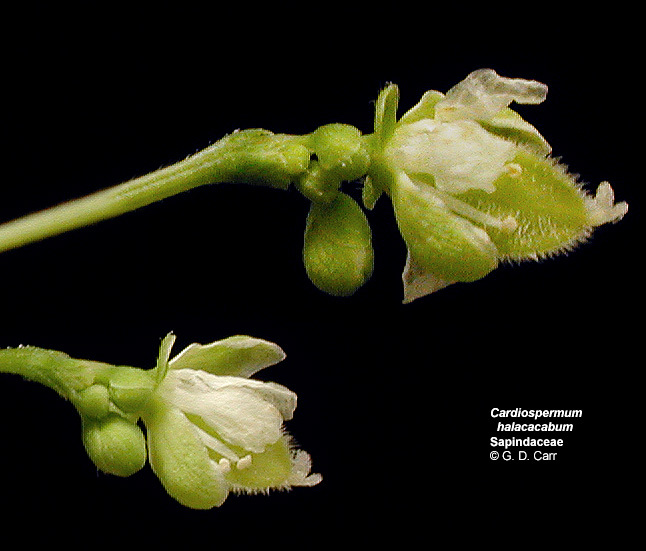 The second photo shows a male flower on the left and a female flower on the right. 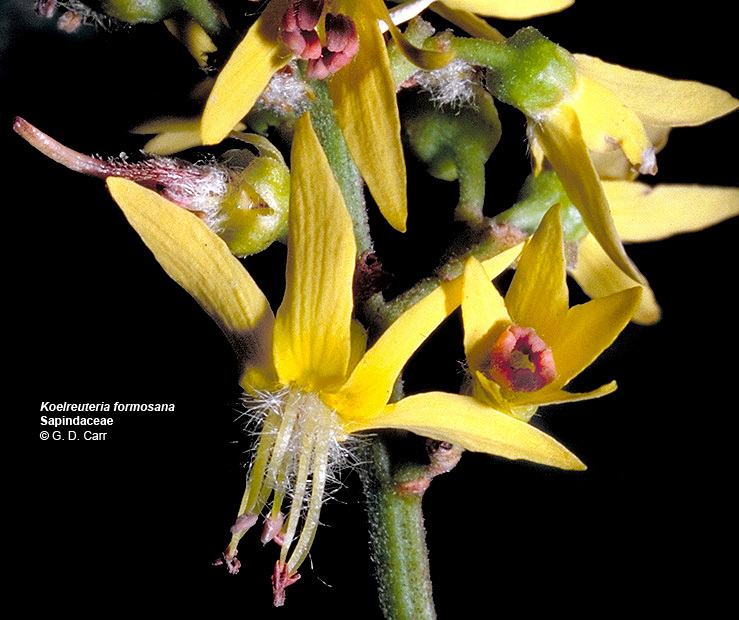 In the third photo the lower flower is functionally male. Note the hairy filaments. 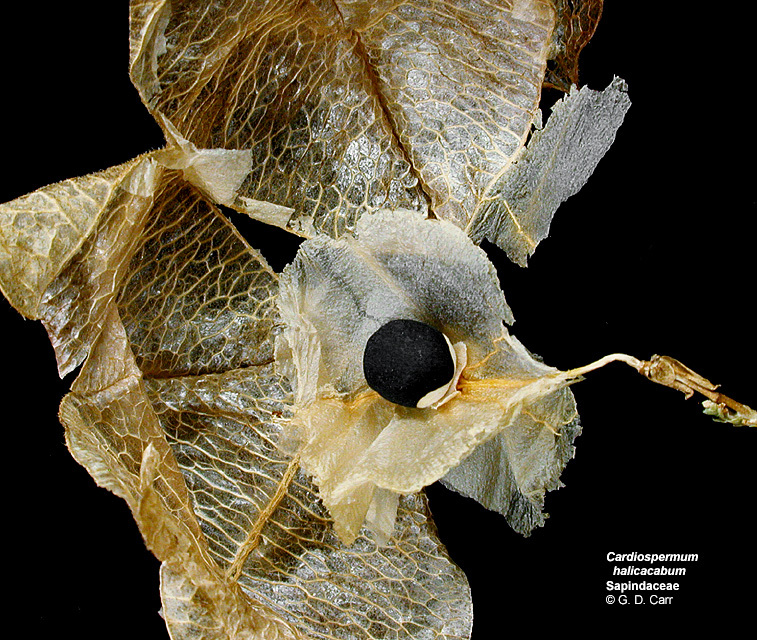 Above and to the left is a developing pistil from an older female flower; a portion of the glistening, yellowish nectary disk can be seen. 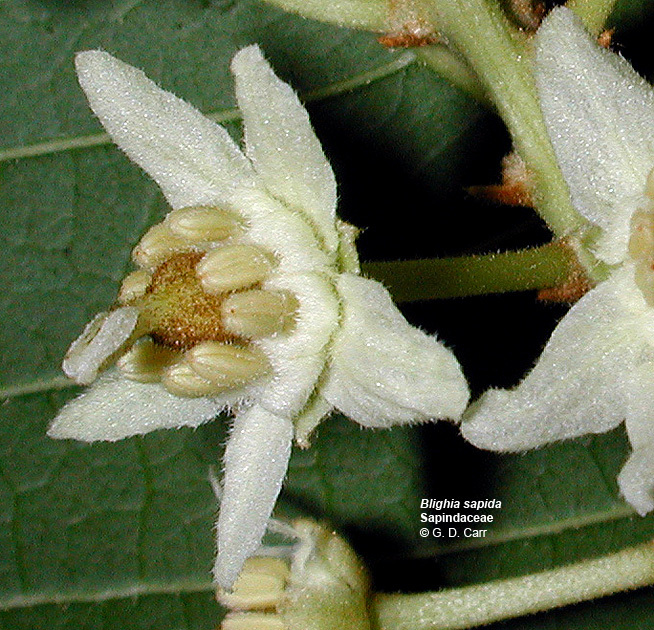 The first two flowers in the lower row are male and the third is female. 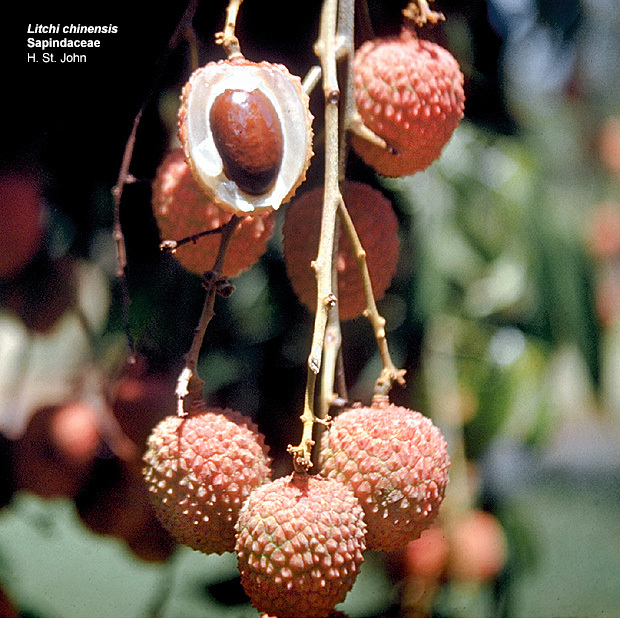 Litchi chinensis, lychee. 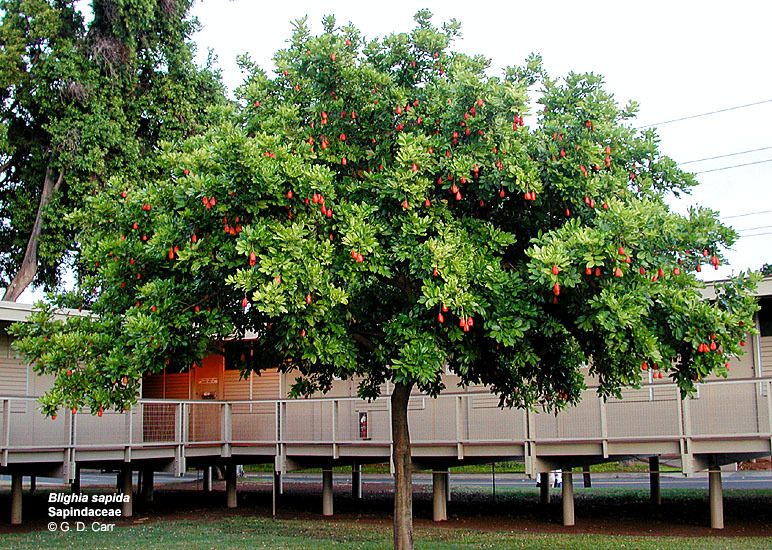 This is a common yard tree in Honolulu, grown for the popular edible fruits. 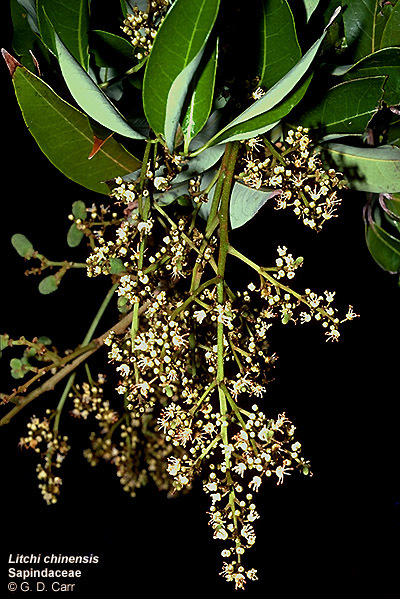 Note the small whitish flowers. 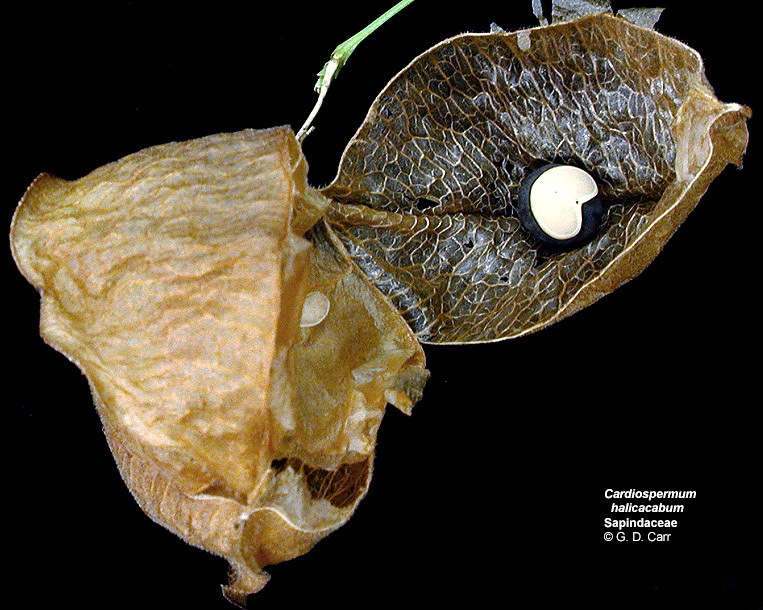 The part of the fruit that is eaten is the whitish pulp visible around the brown seed in the sectioned fruit near the top of the photo on the right. 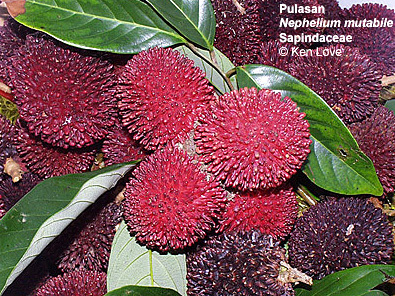 The pulpy part is technically an aril, or outgrowth from the funiculus or seed stalk. 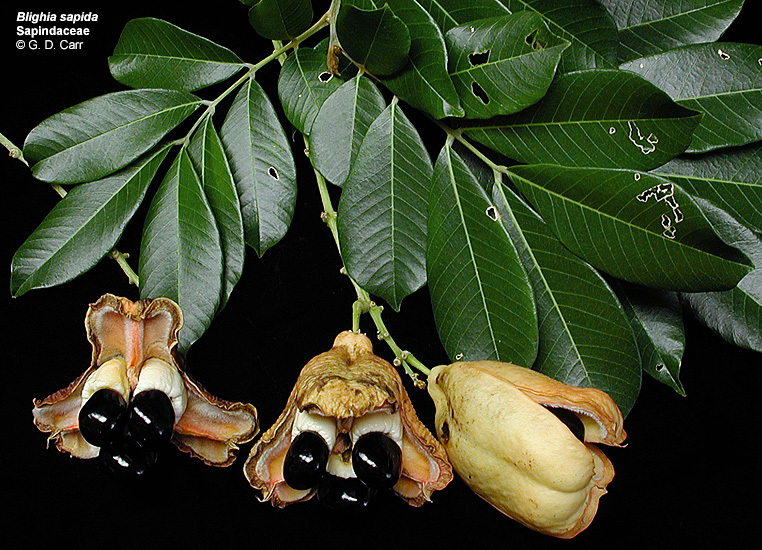 Seeds in this family are commonly arillate. Majidea zanquebarica. 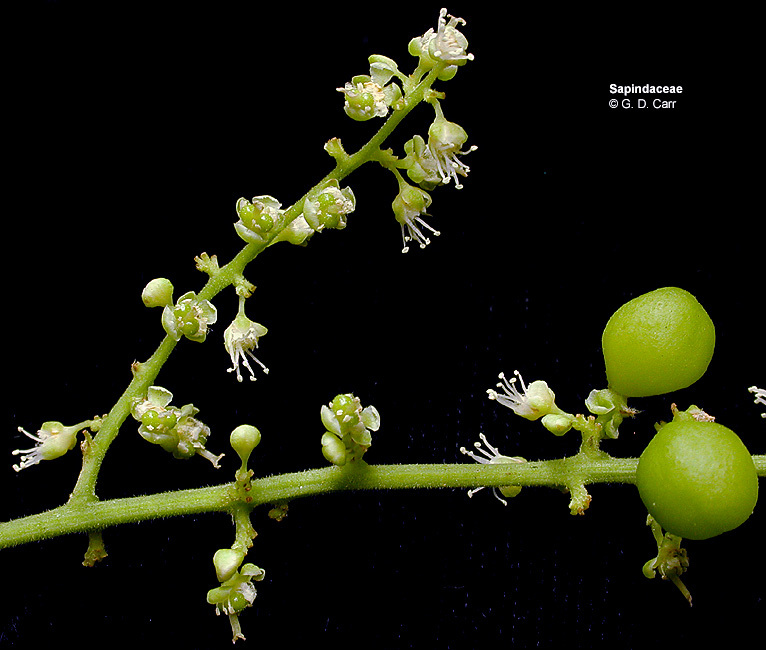 Though fruit types vary in the family, this capsular form is a good representative. 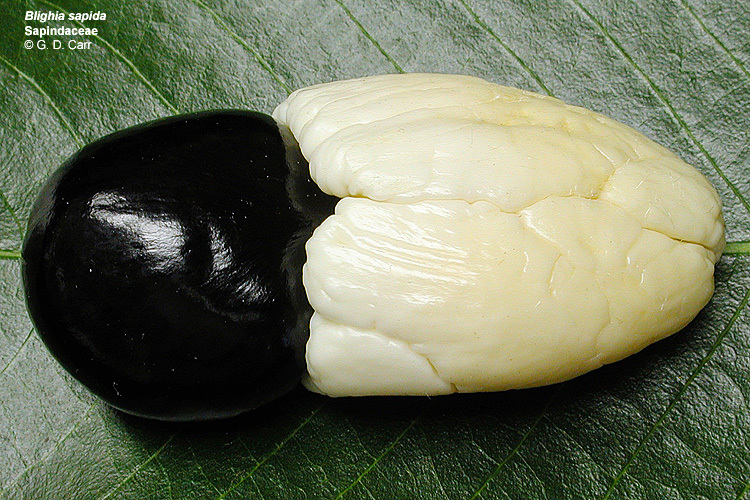 Note the three carpels with one seed attached to each. 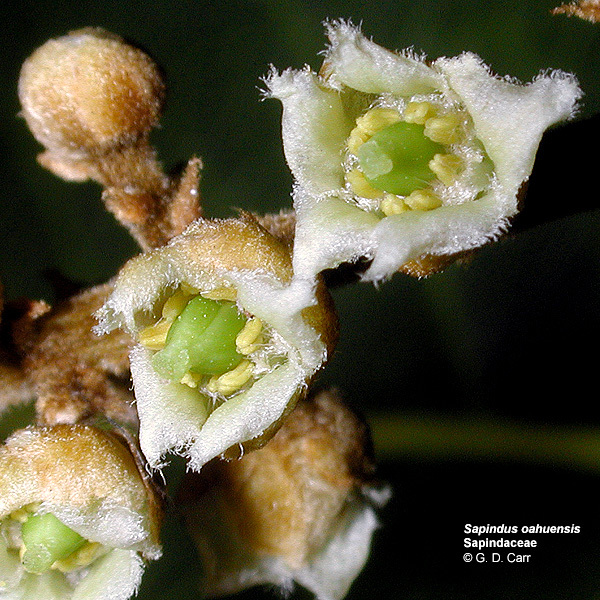 Sapindus oahuensis, lonomea, aulu, kaulu, soapberry, endemic to Hawaii. 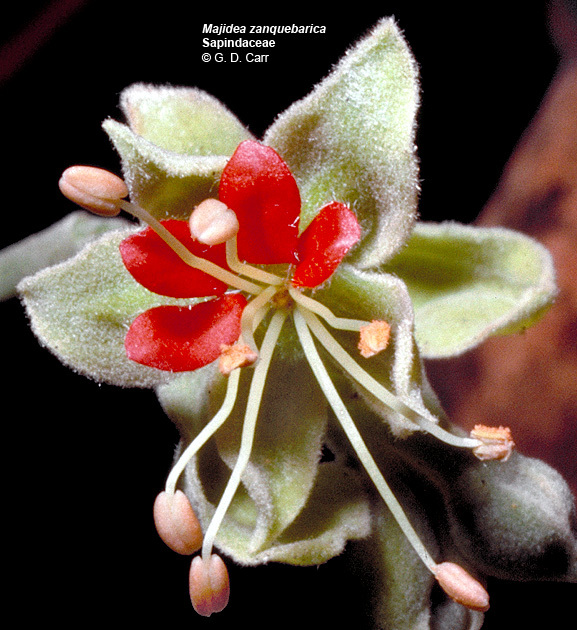 Serjanea exarata, mountain supplejack. 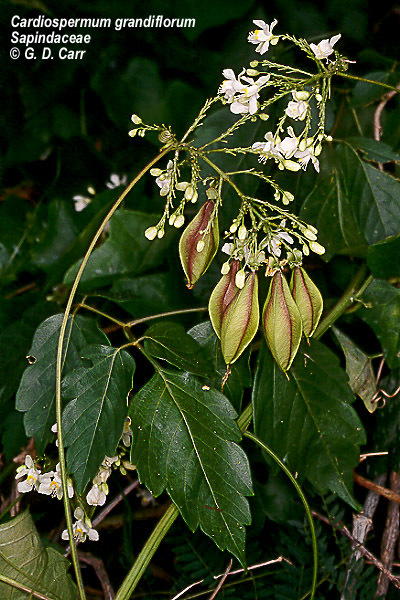 This is a vine with pinnately compound leaves, tendrils, small white flowers, and 3-winged fruits.